The University of Arkansas at Pine Bluff (UAPB) is a historically black university located in Pine Bluff, Arkansas, United States. 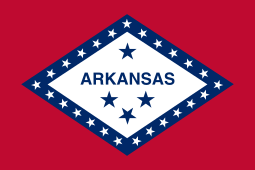 Founded in 1873, the second oldest public institution in the state of Arkansas. UAPB is a member-school of the University of Arkansas System and Thurgood Marshall College Fund. It is known popularly by its moniker the "Flagship of the Delta". The University of Arkansas at Pine Bluff was authorized in 1873 by the Reconstruction-era legislature as the Branch Normal College. A historically black college, it was nominally part of the "normal" (education) department of Arkansas Industrial University, later the University of Arkansas. It was operated separately as part of a compromise to get a college for black students, as the state maintained racial segregation well into the 20th century. It later was designated as a land-grant college under the 1890 federal amendments to Morrill Land-Grant Acts. As Congress had originally established the land grant colleges to provide education to all qualified students in a state, in 1890 it required states maintaining segregated systems to establish a separate land-grant university for blacks as well as whites. In 1927, the school severed its ties with the University of Arkansas and became Arkansas Agricultural, Mechanical & Normal College (AM&N). It moved to its current campus location in 1929. Nearly 50 years later, the college re-joined what is now the University of Arkansas System. As a full-fledged campus with graduate study departments, it gained its current name and university status in the process. Since 1988, the university has gained recognition as a leading research institution in aquaculture studies, offering the state's only comprehensive program in this field. It supports a growing regional industry throughout the Mid-South (according to the school, aquaculture is a $167 million industry in Arkansas alone and worth approximately $1.2 billion in the Mississippi Delta region). Recently the program was enhanced by the addition of an Aquaculture/Fisheries PhD program. The University of Arkansas at Pine Bluff is the largest HBCU in Arkansas. UAPB is divided into eight academic divisions. UAPB is fully accredited by the North Central Association of Colleges and Schools. UAPB has the only comprehensive aquaculture program in Arkansas, established to help support the state's $167 million aquaculture industry. In 2015, Bestvalueschools.com ranked the university second in Arkansas for best overall value. The University Museum And Cultural Center on the campus of UAPB contains photographs, catalogs, yearbooks, letters, artifacts, portraits and other ephemera that document the lives and culture of African-Americans who helped shaped the history of UAPB and the Arkansas Delta. It is the only museum of its kind in Arkansas. UAPB's colors are black and gold and their nickname is the Golden Lions. Arkansas–Pine Bluff's sports teams have participated in NCAA Division I in the Southwestern Athletic Conference (SWAC) since re-joining the conference in 1998, and competes in the Football Championship Subdivision (formerly I-AA) for football. Home football games are held at Golden Lion Stadium. Men's sports also include baseball, basketball, cross country, golf, tennis and track & field; while women's sports include basketball, cross country, soccer, softball, tennis, track & field and volleyball. The Lions participated in the SWAC Championship Game for the first time in 2006 after recording a 7–2 conference record. The Alabama A&M Bulldogs defeated the Lions (22–13) in the championship game. The Lions finished that season with an overall record of 8–4. The Lions won the SWAC Championship on December 8, 2012 against Jackson State in Birmingham, Alabama. UAPB finished the 2012 season 10-2 and are the 2012 Southwestern Athletic Conference champions. In 2009–2010, for the first time in school history, the women's soccer team won the SWAC tournament and made it to the NCAA tournament for the first time ever. Also the men's basketball team received an automatic bid to the NCAA tournament as champions of the SWAC. The Golden Lions won the opening round game against Winthrop and were awarded the #16 seed in the South Region. The team was eliminated from the tournament in the following round by Duke who ultimately became the NCAA Champions. The University of Arkansas at Pine Bluff houses over 1000 students on campus. Hunt Hall and the Harrold Complex each feature rooms on double-loaded corridors, with common area bath facilities. They also all feature computer labs, snack kitchens, laundry facilities, study rooms, telephones and cable television in all rooms, and lobbies. Internet access is available in all rooms. Hunt Hall houses male students. The Harrold Complex, consisting of four halls, Johnson, Copeland, Fischer, and Stevens, is for females. Freshman males are assigned to Johnson and Copeland. Built in 1955, Hunt Hall was named in memory of Silas Hunt, the first black law student at the University of Arkansas at Fayetteville. Hunt Hall has two floors and houses 134 male students. Built in 1964, the Harrold Complex was named in memory of Norma E. Harrold, former Dean of Women. It has four halls and houses a total of 512 male and female students. Johnson Hall was named in honor of Nettie E. Johnson, a graduate of the class of 1903; Copeland Hall was named in memory of Ernestine Inez Copeland; Fischer Hall was named in memory of Rubye G. Fischer, a former principal of the J.C. Corbin Laboratory School on campus; and Stevens Hall was named for the late Maggie R. Stevens, a former counselor at Branch Normal College. The Johnny B. Johnson Complex, JBJ, can house 288 students. 8 students are assigned to each 4-bedroom suite, which includes two baths, a living and dining area, and a small kitchen with a full-sized refrigerator and microwave oven. JBJ has dining and laundry facilities that are exclusively for the use of its residents. The Upperclassmen Honor Suites are located at JBJ. Occupancy at JBJ is limited to those students with a minimum of 30 hours and a minimum GPA of 2.0. Preference is given to those students with at least two semesters of on-campus residency. Built in 1991, the Complex was named in honor of Dr. Johnny B. Johnson, former Chancellor of the University of Arkansas at Pine Bluff. JBJ has nine buildings and houses a total of 288 male and female students. The newest residence hall is the new Delta Housing Complex. Built in 2003, it offers first-class living accommodations. This suite-style complex has 104 private rooms and 140 double rooms; it houses 388 students. In 2008, UAPB's band known as the Marching Musical Machine of the Mid-South (M4), made their debut appearance at the Honda Battle of the Bands. In 2009, M4 was selected to participate in the United States Presidential Inaugural Parade. The marching band has 200+ members and a dance auxiliary line called The Golden Girls. M4 is a five drum major led marching band. Other Greek organizations include Kappa Kappa Psi, Tau Beta Sigma, Phi Mu Alpha, Sigma Alpha Iota, Mu Alpha Mu, Mu Alpha Nu, and Lambda Alpha Mu. There are over 70 active student organizations on campus. All active student organizations are registered through the Division of Student Affairs. Burgess only attended one year before enlisting in the U.S. Air Force. After serving a four-year tour, he transferred to Gonzaga University, where he eventually earned bachelor's and law degrees. ↑ "Academics - University of Arkansas at Pine Bluff". uapb.edu. ↑ "ESPN – Arkansas–Pine Bluff Golden Lions News, Schedule, Players, Stats, Video – College Football". ↑ "For a University Band, A Fast Paced March to the Inaugural Parade". The Chronicle of Higher Education.